An unusual and enchanting quilt for several reasons, Clarissa's scrap quilt (107" x 105") will inspire you in many ways. It is unusual because of its New England based " T" -shaped construction and enchanting because of the charming stenciled designs sprinkled throughout the quilt. Created when Clarissa was just 17, it is a veritable showcase of the fabrics and motifs of the time period. 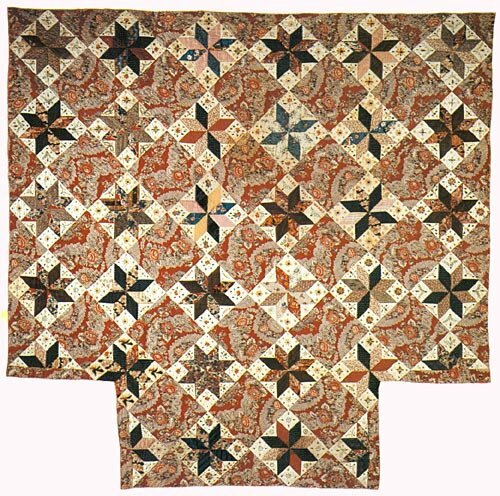 The pattern includes interesting 19th-century diary excerpts on homemade fabric dye, and brief historical information regarding the Eight Point Star and early stenciling. The 14 painting stencils included have been authentically reproduced and maintain the integrity of the 19th-century originals. Hand and quick-piecing dimensions are given along with instructions for a " T" -shaped or more modern square quilt.